Halloween is almost here, and this year it falls in the middle of the week. That makes your commute home a bit trickier as children may be roaming the streets already. And although it’s always important to watch for pedestrians, it is especially crucial on Halloween. Aside from being safe on the road, it’s imperative to mind your children and your home. Here are some Halloween security tips to help you enjoy a safe and happy Halloween. Although going door to door collecting candy and treats from strangers is a Halloween tradition, it poses safety risks. Check All Treats Before Eating – All treats should be inspected by adults before children eat them. To be safe, toss anything that looks tampered with and anything that doesn’t come in a pre-wrapped package. Light Up The Night – Make sure your children are easily visible with flashlights, glow sticks, or even reflective tape. To make it easier, try using transparent bags for your children’s treats and toss a glow stick in there. That way, your kids have one less thing to carry and they are still easily visible. 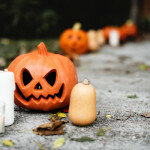 Consider An Alternative – If you would rather your children not go trick-or-treating, you may want to consider an alternative such as a haunted house or hayride. Or you can visit friends or family so that you need not worry about what they get in their bag. Host your own Halloween – Or you can simply host your own Halloween event at your home. This way, you are in the comfort of your own home and can keep an eye on your children and guests. Leaving a porch light on when you leave for the night may not be the best idea. On Halloween, that is commonly known as a sign to come knocking for treats, and thus, people will soon realize that no one is home. Here are some ways you can protect your home while you are out. Be sure to keep your home well lit. This will deter potential intruders or pranksters as it will appear as if someone is home and still awake. 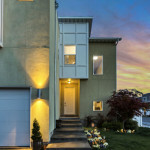 Outdoor lighting will eliminate shadows and hiding places. Engage your security system if you have one. If you do not, now would be a great time to invest in a solid home security camera system. Settings – Review your camera settings and adjust accordingly. Keep your cameras focused on potential entryways (doors, windows), but you may also want a view of the streets and other areas around your home – pranksters may attack from any or all sides. Timers – Make use of light timers if you have them. Set timers to have specific rooms light up every now and then. For example, leave the living room light and television on but have the kitchen light turn on and off occasionally so it appears that someone is getting up for a snack. Arm Your Security System – Sometimes we may forget so it’s worth the reminder to set the alarm and lock your doors and windows before you leave. For most of us, cell phones act as our lifeline and have become essentials alongside our wallets and keys. If your child does not have a cell phone and will not be with you on Halloween, be sure you have the phone number for the supervising adult or someone who will be accompanying your child. You may even let your child borrow your phone for the night so that you have a way of keeping in contact. Charge It – Whether it’s your own phone or your child’s or both, be sure that all phones are fully charged before heading out. If your child is going out without you, you may want to check the signal reception where he/she may be. Check Your Security System – Your security system most likely enables remote viewing via an app or device, and should alert you of any suspicious activity. If alerts are not enabled, be sure to check in periodically. Although we may hate to imagine that persons with bad intentions may target us on Halloween, it is always a possibility. If you’d like, you can leave a bowl of candy on the porch with a sign that tells children how many they can take and that they are under surveillance. If you sit on the porch and hand out candy, keep your cell phone close and sit with a friend or family member (safety in numbers). In addition to the aforementioned security tips, it is always in your best interest to use common sense on Halloween and every day. Make sure children stay away from strange neighborhoods and that they know they should not go inside someone’s home. If possible, travel with a group for maximum safety. Do you have any other Halloween safety tips to share? Connect with us on Facebook, Google+, Twitter, LinkedIn, and Pinterest. Invest in an affordable security camera system to protect your home. Visit SecurityCamExpert.com to browse our selection or call 888-203-6294 to discuss your options. When shopping for a security system for your home or business, it may be easy to focus on the specific features of the security cameras. However, much attention should be paid to video surveillance storage as well. DVRs (digital video recorders) are an integral part to the overall surveillance system. Here are some of the features and specifications of DVRs that you should pay close attention to. A frame rate is a unit of measure denoting the number of frames recorded in each second by a DVR in a specific resolution. Calculations should be made based on the real-time frame rate of about 30 frames per second (FPS). For example, in order to record real-time video on a standard 16-channel system, you would need a DVR that has 480 FPS. Remember that sellers may claim real-time images as the units display live video at about 30 FPS on each channel, but this needs to be assessed based on the recorded video footage (not the live video). A basic unit may record videos at less than 30 FPS while a top-end unit may deliver 30 FPS on each channel. Resolution is the size of the image displayed or recorded. The most popular resolution is CIF – 360×240, and the highest is specified as D1 – 720×480. This is an important specification to consider as larger recorded images afford you additional details for review. For example, 4CIF images can feature views detailed four times as much as a base CIF image. You can find a variety of DVRs boasting anywhere from CIF to D1 resolutions. When the video is transferred to the DVR for storage, it is first compressed to save space and to make Internet viewing fluid. Compression standards can vary from basic to nearly no compression protocols (ex. MJPEG or wavelet) to the top-end compression methods (ex. MPEG4). Currently, the highest compression standards are H.264 (which is 40% more efficient than previous versions). While compression methods may vary in DVRs, hybrid DVRs are available. These are capable of using a combination of compression methods, and can also be used to do compressions separately (Internet streaming vs. recording). You will need to know how much data your DVR can hold. Presently, baseline DVRs may allow one or two hard drives only, while more advanced models now offer 6, 8, or more internal hard drives based on user requirements. Popular DVRs also offer redundant storage (RAID) configuration and FTP uploads. The FTP uploads feature allows backup of video for the DVR at an off-premise FTP server. This helps to avoid any possibility of loss in the case of a local system crash or a DVR robbery. Audio can sometimes be an important addition to video footage. Some DVRs may accommodate synced audio and video, with lower-end versions having one to four channels and higher-end options offering up to 16 channels. Be sure to review the laws and legalities in regards to audio recording. There can be a wide variety of video output, from BNC to VGA to HDMI. If you have a mix of these, you may need to invest in quality converters to ensure proper connections and performance. Network IP surveillance systems allow users to access video footage via the Internet from virtually anywhere. Advanced systems even allow viewing more than one DVR at a time. These DVRs can boast specialized features such as camera groupings, e-mapping, different levels of user privileges, and more. If you need assistance in choosing the right DVR and security cameras for you, please feel free to contact us 888-203-6294 or browse our vast selection online at SecurityCamExpert.com. You can also connect with us on Facebook, Google+, Twitter, LinkedIn, and Pinterest. As we embark on the summer season, home security is emphasized. The long days and warm weather call for later nights, weekend getaways, and vacations. Whether you stay home or not, up your home security with these helpful tips. With several different points of weakness (ex. handle, lock, hinges, frame) an exterior door is a common target for burglars. Sliding doors and French doors present even more weaknesses. Invest in a sturdy deadbolt lock – the spring-latch lock on your door handle is easily compromised. Install door armor kits on exterior doors, which usually include 3″ screws to replace short screws that come with door hardware, hefty strike plates for handles and deadbolts, and metal framing to place around the hinge and handle/lock hardware. This helps to reinforce the weak points of your door and safeguard against intruders. Add auxiliary locks to sliding doors, such as loop locks, security bars ( also known as sliding door polls or Charlie bars), or vertical bolt locks. Add a security bar to French doors to prevent kick-ins. While they may not be visually appealing, they are effective. With French doors, and most doors in general, make sure all of your hinge pins are interior-facing to avoid giving burglars easy access without force. Glass doors should be enforced with security film. This prevents glass from being easily broken. Luckily, there are numerous ways to increase window security, whether they are old or you are installing new windows. Choose reinforced (tempered or laminated) glass or acrylic (polycarbonate) windows. These are much harder to break than traditional glass windows and can help deter criminals from continuing after the first attempt at breaking in. Choose multiple panes of glass instead of one large pane. Multiple glass panes provide added strength and durability. Add after-market window locks to your built-in window locks. These provide an easy and inexpensive way to prevent windows from being forced open. Depending on the style of your window, you may need double hung window locks, sliding window locks or locks for casement windows (sometimes called crank windows). For additional protection, exterior windows bars may be added. Aside from protecting your windows, most of these window bars come in decorative designs to accent the style of your home. As previously mentioned, security film can be added to windows to decrease the likelihood of break-ins (thicker film provides the highest level of protection). Unfortunately, an attached garage door can be easily compromised, and garage door security is often overlooked. What is especially troubling is that after gaining access, burglars can quickly shut the garage door behind them and take their time rummaging through your home without being seen. Refrain from leaving garage door openers in your vehicles. It may seem inconvenient, but it is worth the security. Secure your garage door emergency release to prevent easy intruder access. You may fasten it with a zip tie (which can be broken by yanking the release cord) or place a barrier between the top of the door and the release. A garage door sensor can alert you when your garage has opened. Newer garage door openers have this feature built-in as well as an auto-closing feature that will close your garage door after a long period of time. A deadbolt on the door between your garage and home will help to prevent further intrusion. You may want to also install a peephole viewer on this door to make it easier to inspect the garage without opening the door. Install a bright, motion sensing light in the garage to bring attention to an open garage door. Regardless if you are home or not, you want to make it look like your home is occupied. An unoccupied home is a prime target for burglars. Use strategically placed lights and lamps with timers. Lights turning on and off in different rooms will make it appear as if you are home. Leave a television or radio on at moderate volume. Noise will make criminals think you are home, and the light from the television mimics activity. Leave some curtains or blinds open. This is helpful if you are using light timers or a television to cast light. It can also be helpful should police or a neighbor need to take a look into your home. Some of the best tactics are not thought of as prevention techniques. Get a dog. A barking dog may make enough noise to bring attention to an approaching burglar and deter them from proceeding. Invest in a home security system and signage. This may deter them from targeting your home, and if it does not, you know your home is protected and that police will be alerted in a timely fashion. 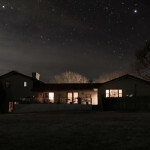 Outdoor lighting is a great way to keep intruders away. Darkness allows intruders to sneak around your property unnoticed, but dusk-to-dawn porch lights and motion-activated lights around your perimeter help to increase visibility. Keep a car parked in the driveway. This makes it seem that someone is home. Maintain your landscape and keep bushes and shrubs near windows trimmed to minimize hiding spots. You may even consider planting thorny or spiked plants (ex. blackberry bushes, holly, juniper) to prevent burglars from getting too close. Have your own tips to share? Connect with us on Facebook, Google+, Twitter, LinkedIn, and Pinterest! Need help finding the right home security system for you? Visit SecurityCamExpert.com to browse our selection of surveillance systems or call 888-203-6294 today! Home security camera systems help home owners protect their property and loved ones. They provide an extra set of eyes to monitor your home whether you are at home or away. Because of the financial investment, it is important to ensure that everything is working properly. There are many ways in which you can optimize your surveillance cameras to get the most out of your security system. Here are a few smart security tips to improve your system. A security camera that is recording everything all the time sounds good in theory, but will require a large amount of memory and power. It will also be more difficult to sort through the mundane footage to find what you are looking for. Thanks to motion detection, your camera does not have to record all the time. Motion detection enables your camera to start recording when activity in the field of view triggers the sensor. This means you will not need to worry about running out of storage space and makes it easier to sort through your recordings. Choosing the right location for your security cameras is crucial. Be sure to adjust the angle of your camera to maximize your field of view and ensure that obstructions, such as trees or bushes, do not block the camera’s view. Although security cameras are important, they cannot do everything. Pairing your security camera system with a high quality and reliable alarm system can increase your home security overall and may even help with insurance discounts. 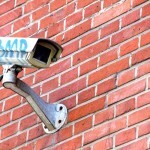 While an outdoor security camera is common, often times, one camera is not enough. If there’s only one security camera present, it’s likely that burglars will work around that. You want your security cameras to monitor high traffic areas and points of entry (ex. front door, back door, first floor windows). That way, you get more comprehensive video surveillance should you become a target for home invasion. You can’t just set it and forget it when it comes to your surveillance system. Keeping your cameras clean and any potential obstructions at bay will help maintain the performance and effectiveness of your system. Skipping routine maintenance checks may cause your cameras to miss important moments. Do you have any other home security tips? Share with us on Facebook, Google+, Twitter, LinkedIn, and Pinterest. For a great selection of affordable security cameras and CCTV surveillance camera systems, please visit SecurityCamExpert.com. For more information about our installation services or to request a free quote, please call 888-203-6294. 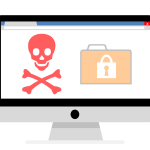 Ransomware is often transmitted by email or web pop-ups and involves hackers holding your data hostage with threats of destroying it unless a ransom is paid. The recent WannaCry ransomware attack involved cybercriminals hijacking numerous Windows computers in more than 150 countries. What is unfortunate about this attack, and sadly, many other attacks, is that cautious online behavior and safe security practices could have prevented this. To keep your business and data safe, check out these expert security tips. The WannaCry attack is believed to have been spread through an email download. Dishearteningly, a security patch for this vulnerability was released eight weeks prior to the attack, thus, the crisis could have been avoided. Users often refrain from actively checking for updates, leaving their equipment and data at risk. An easy remedy is to set up your system for automatic installation when updates are available. And just because Windows computers were the main target in this situation, does not mean that other devices and systems are in the clear. Remember that all operating systems are at risk, so regardless of the devices you use, you should always install the latest security updates and patches. Aside from keeping your software up to speed, antivirus software can help prevent malware from infecting your computer. Just remember to keep it up-to-date and only download antivirus apps from reputable vendors (ex. Kaspersky Lab, Bitdefender, Malwarebytes). As previously mentioned, it is believed that the WannaCry attack stemmed from email attachments. With that said, we should all be wary of dubious emails containing links or attachments. Things to look out for include the sender (make sure it’s coming from a legitimate address) and any typos or grammatical errors in the body. If there are hyperlinks, hover over them (but don’t click!) to see whether they direct you to suspicious web pages. If an email appears to come from your bank, credit card company, or internet service provider, keep in mind that they will never ask for sensitive information (ex. password, social security number). Lastly, just say no to pop-up windows, regardless if they are advertising software products that remove malware. Whatever it may be is too good to be true and not worth the risk, so simply close the pop-up carefully. Generally speaking, creating a copy of your data is always a good idea in case your computer fails or is lost. In the event that your computer is successfully hijacked, you can be your own hero. You can simply wipe your computer clean and restore your data with your backup copy. For added security, back up your data onto an external drive, and then store it somewhere safe and away from your computer. And be sure to backup your data regularly. Applying companywide security updates for larger businesses can be challenging, which is why a security plan will come in handy. A strict schedule for installing the latest updates with minimal interruption to productivity should be implemented. The IT department should also actively and regularly educate and test employees on spotting suspicious emails. If you find that you are a victim of ransomware, your first step should be to disconnect your computer from the internet to limit spreading the attack to other machines. Next, report the crime to law enforcement and get help from a tech professional who specializes in data recovery (this is the best person to detail your options for you). Remember to not lose hope, as future security tools may be able to unlock your files. Only in extreme cases should you consider paying a ransom. For example, if you have no backups and the encrypted files are of great value, paying the ransom may be your only route. However, in the WannaCry case, you should NOT pay the ransom as some victims have and are not hearing back from the cybercriminals. What security measures or plans do you implement at home or at your business? Share your top security tips with us on Facebook, Google+, Twitter, LinkedIn, and Pinterest! Invest in our excellent security cameras and CCTV surveillance equipment for your physical security. Browse online at SecurityCamExpert.com or call 888-203-6294 today! These days, most of our devices are connected thanks to the Internet of Things. While this can make things more convenient for us, it can also leave us vulnerable to hackers. There have been many public stories about cyber attacks and spying, from hacked baby monitors to internet outages. And while we may never see an end to cyber criminals, this proves that we can never be too cautious. These unfortunate hacks can occur from unsecure Wi-Fi connections, open devices (no passwords), or malware attacks. Luckily, there are ways to combat attacks and minimize our risks. Heed these cyber security tips that may apply to security cameras, webcams, as well as baby and pet monitors. Employ a full-service security suite for your internet and keep it up to date. Use a strong, unique password and encryption to protect your network. Always change the default password that comes with your wireless networks and any of your devices. When choosing a password, remember to incorporate numbers, capital letters, and, when allowed, multiple punctuation marks. You should also try to use 12 digits, and avoid names, places, or anything that can easily be guessed. To ensure you’ve created strong and secure passwords, use a password checker. As stated previously, keep all your devices and software updated as these help to patch any known or found vulnerabilities that allow hackers to gain access. Although this simple step can easily be overlooked, it is important to stay on top of these updates. If your camera indicator light goes on without your permission, you can assume that your computer has been compromised. However, just because the light is off, you cannot assume that your camera is safe. Researchers have found that hackers can infiltrate and turn on webcams without activating the indicator light. To err on the side of caution, keep your cameras covered. There are different types of patches, stickers, devices, and other products on the market that you can use. However, for an immediate fix, masking tape will suffice. Don’t Click That Suspicious Link! If there is any uncertainty, do not click the link. Only download attachments or click on links from people you know and trust. If you were not expecting a message or attachment from a trusted person, be sure to check with them before opening or downloading anything. Public Wi-Fi networks are prone to hackers so avoid them when you can. If your security system permits (most do), check the IP addresses that have accessed your cameras. If you find any suspicious IP addresses on your log, be sure to change your access codes right away and notify your security company. Network connected security cameras allow you to remotely monitor your cameras via an app or a website. If you do not need this feature, turn it off. It may be beneficial to have one network for your phone and computers and another network solely dedicated to your security systems and other monitors. Being an educated consumer will minimize your risk of becoming a victim. These security precautions promote safe use of personal technology and can go a long way for your cyber security. Connect with us on Facebook, Google+, Twitter, LinkedIn, and Pinterest to share your own cyber security tips. Need quality security cameras and CCTV surveillance equipment? Look no further than SecurityCamExpert.com! Call 888-203-6294 to schedule a free* site survey, request a quote, or inquire about our installation services. Protecting our families, homes, and valuables is a top priority. Home and business security systems aim to give you peace of mind when it comes to intruders, however, not all properties are created equal. A security system tailored to your specific needs is a smarter option. Aside from consulting with Security Cam Experts, you should also take note of these statistics and security tips. According to the FBI, in 2014, there were 1,729,806 burglaries in the United States. Of those burglaries, 73.2% were residential burglaries. Of these residential burglaries, nearly 28% occurred during the day while over half happened at night. Top targets include women living alone or wealthy senior citizens. Burglars also choose targets by the type of car you drive, what neighborhood you live in, the size of the home, or signs that a home is unoccupied. Never open your door to strangers or solicitors. Remember that delivery persons need not step into your home to make a delivery. Never rely on a chain-latch as a barrier to partially open the door. With enough force, it can easily be broken. If you don’t have one already, install a peephole and always use it to see who is at your door before opening it. Lock all doors, windows, and garages at all times. This helps to prevent unwanted intruders from simply walking through an unlocked entrance. Choose heavy duty locks and use four three-inch screws to secure heavy duty lock strike plates in the door frames. See something, say something. If you notice any suspicious stranger activity, call the police. Have a family meeting in regards to home security plans so that everyone is on the same page. Having something to protect you is better than nothing, which is why even a simple dummy camera can make a difference. But if you can afford it, investing in surveillance systems and home alarm systems can be a great benefit and put some of your worries at ease. If you have any questions or want to shop a wide variety of affordable security cameras and equipment, please call 888-203-6294 or visit SecurityCamExpert.com today! You can also connect with us on Facebook, Google+, Twitter, LinkedIn, and Pinterest. Concerns about the security of your home and loved ones can be especially high during the holidays. With increased risk of thefts and burglaries, it is important to employ the proper security methods to put your mind at ease. Here are a few ways you can secure your home and protect your assets. Perform an all-hazards residential risk assessment. By completing this assessment, you can recognize any threats that may not be detected by even the best alarm system. Some things to consider include who may have access to your home, how prepared you are for a natural disaster or civil emergency, and whether there is any online or public record information that could possibly compromise your security. Install a customized home security system and use it. A home security system, complete with a backup power source, is a crucial component to protect your property. If you own any vacation homes, be sure to secure and monitor those as well. If a security system came with your home, you may need to reevaluate how it suits your needs. If needed, invest in upgrades or a whole new system. Assess your risk points and go from there, but be sure that it is user-friendly as well, so that your family members can access and easily operate it. Annual follow-ups with your security provider are recommended. Update contacts, information and make any adjustments as necessary. Develop and practice an emergency response plan. You should be prepared for a variety of emergency situations. While most commonly associated with natural disasters, emergency plans can also be implemented for other situations, such as home invasion, storm evacuations, and other crises. In case of emergency, be sure to have secure locks and the proper emergency supplies. In the event of your home security being compromised, you should have a rapid response plan. Prepare a “grab-and-go” packed with essentials, including communication tools and meeting information. Aside from having these plans in place, you will want to rehearse with all family members so that they know and understand their role in keeping everyone safe. Try to practice these at least once a year so that the appropriate steps stay fresh in their minds. Know who has access to your homes and properties. Your biggest threat could be someone you know, who knows your residence and schedule. These people can include domestic staff such as housekeepers or child care providers. Be sure to follow best practices before hiring home employees. For prospective domestic employees, be sure to do a professional background check – do not rely on a simple Google search. Ask trusted friends or an attorney to recommend a private investigator or third-party service that can pull up critical information using the candidate’s name and date of birth. If you are using a placement agency, be sure their background checks are comprehensive and legitimate. When hiring, include a pre-employment application which authorizes criminal and credit checks, and always check references and conduct in-person interviews with potential candidates. While there’s no obligation, be prepared to provide severance pay upon departure of a terminated employee. Thoughtful treatment at termination can go a long way toward preventing a disgruntled former employee from retribution. Despite the fact that most domestic employees often need money for home-related expenses, you should never give an employee your personal ATM car or password. Use a separate account for household expenses and designate the employee as an authorized cardholder, or consider using prepaid debit cards, which can put a limit to the amount spent. Both options allow limited access to your personal accounts while allowing you to track spending. Remember that anyone who has access to your property can present a security risk. This includes any building contractors, landscapers, electricians, and the like. Before proceeding with any services, speak with the principal of the company and find out if they are licensed and insured, whether they do background credit and criminal checks and periodic drug testing on employees, and ask for a roster of people who will be at the property on a regular basis. If any information seems questionable to you, look for services elsewhere. Despite your efforts to keep your personal information private, there is information about you that is publicly available. One piece of information about you may seem harmless, but when it is combined with other public information, it can be used to gain insight about you (ex. income, properties) which may attract criminals. Luckily, there are ways you can control your public presence. Enlisting an online security consultant should be the first step. They will evaluate your public “footprint” by doing a thorough search of the Internet and present you with the results. From there, you can work together to assess and manage any and all threats. Ensure that the whole family is on board, especially children who are active on social media. Everyone should understand how to engage in responsible online behavior. Beware of whom you share your information. Your information can still end up online through reputable third parties (ex. charities, schools, civic groups). These public entities often mean well, but most lack strict cyber security systems and protocols to keep your information secure. If you are going to make a major donation or real estate purchase, use a trust account to protect your identity and any other sensitive information associated with it. Choose a trust name that is different from the family name and associate it with a nonresidential address such as a P.O. Box. Commercial and public sites can reveal details about your home you would rather keep private. For example, your realtor’s website may still contain photos of your home long after the close of the sale, while other sites may list pricing history of your property. Most of these sites will remove your information per request. You may want to discuss these issues with your real estate agent as they may have more insight on how to keep your information private. While it is not ideal to think about the possibilities of something going wrong, it is beneficial to be prepared. Aside for the aforementioned measures, what else do you do to ensure your security? Share with us on Facebook, Google+, Twitter, LinkedIn, and Pinterest. To invest in quality CCTV surveillance cameras and security systems for your home, please visit SecurityCamExpert.com or call 1-888-203-6294. Inquire about a free quote, site survey or our installation services. Wireless surveillance cameras are also known as IP (Internet Protocol) cameras. Aside from securing your property inside and out, they are also often used as baby monitors. When used as baby monitors, wireless IP security cameras are often equipped to pick up audio as well as video. With these cameras, video footage is streamed to a secure online space and you may view what is happening on a computer or via a mobile app or device. To ensure the security of your live feed, these cameras should offer encryption for your streamed data along with a username and password protected hub or app for viewing your footage. Does your system or equipment lack any of these? Do you want added security for your wireless surveillance cameras? Follow these tips to ensure the most secure experience. Aside from securing your devices, the wireless network you connect to should also be secure. If you are using your home network, make sure your router is configured to use WPA2-based encryption. This will cover the connection between your cameras and router, while the stream’s encryption handles the rest. You will want to steer clear of viewing your feed over open wireless networks. If you enter any usernames or passwords over these networks, they could potentially be “sniffed,” leaving you vulnerable. 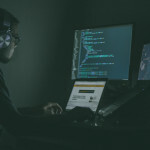 While these can be helpful when it comes to decreasing your mobile Internet charges, connecting to these open networks should not be done without the assistance of a VPN (Virtual Private Network). Having your camera stream footage online 24/7 can be helpful, but it also leaves you more susceptible to privacy risks. Your ISP may be hesitant to support your excessive bandwidth needs for your IP security cameras, and any bugs in your system could threaten the security of your feed. Online streaming should only be done when you are certain the stream is secure. For the remainder of the time, maintaining a closed and secure network for your IP cameras on a secure network should suffice. Cameras usually have the ability to be password protected, but you must manually enable it. Once this feature is enabled, you MUST change the defaults. Since the default usernames and passwords for most cameras are easily to find, this is the easiest way hackers will be able to access your feed. Aside from ensuring that your cameras are password protected, you should be sure that any device you use to access your feed is password protected as well. For example, if you access your feed from your mobile device, and somehow it gets lost or stolen, someone may have unauthorized access to your feed, as well as other personal information stored on your device. With all this being said, the location and positioning of your cameras play an important role as well. In the worst case scenario, your feed gets broadcast to the public internet. Be sure that you position your cameras in areas in and around your property that you wouldn’t mind strangers seeing. For example, if you must install a camera in your bedroom, avoid pointing it at your bed or any area where you usually change. You may also be worried about your webcams now, too. While threats may arise from time to time, there are ways to keep your webcam secure, such as disabling Flash, updating firmware, and using firewalls. If you built a custom IP security camera using webcams, hacking threats should be minimal. You have likely used dedicated, reputable software and taken the time to properly configure and secure your system with a username and password. To make sure that you keep your devices secure in the future as well, make sure that you keep any and all devices related to or connected to your system up to date. This includes your camera’s firmware, client software on your PC or mobile device, and more. These updates often contain patches for any new threats, and without the proper update, your system could be left vulnerable to an attack. How do you secure your surveillance system? Do you have any tips to share with us and your peers? Connect with us on Facebook, Google+, Twitter, and Pinterest. For a great selection of IP security cameras, CCTV surveillance packages, and more, visit SecurityCamExpert.com. To speak with a representative about our products and services, please call 1-888-203-6294. Spending time with loved ones, presents, the end of the year – There’s a lot to look forward to when it comes to the holidays. Unfortunately, with the good comes the bad. There’s often an increase in package thefts and scams during the holidays. Luckily, if you play it smart, you can avoid becoming a victim. Here are some holiday scams to look out for this year. Fake Shipping Notifications Be aware of what you order and take note of sender address, typos, and such. These emails may contain attachments or links which may potentially download malware on your computer or steal your personal information. Like any attachments in your inbox, proceed with caution. E-Cards If you receive an electronic holiday card, be sure that you can easily identify who it’s from and that you do not have to enter any additional information to access the card. While they seem like a nice sentiment, it could be a ploy to steal your information. Letters From Santa There are companies that provide personalized letters from Santa, however, there are also scammers who mimic these services to steal your personal information. If you are thinking of using a company, check with the bbb.org first to see if they are legitimate. Temporary Holiday Jobs If you’re looking for a temp job to gain extra income during the holidays, be sure to apply in person or go to the retailer’s main website. There are listings out there that may require you to share personal information online or even pay for a job lead. If you encounter any of these, consider it a red flag and look elsewhere. Unusual Forms Of Payment Avoid anyone who asks you to pay with prepaid debit cards, gift cards, wire transfers, third parties, etc. These forms of payment cannot be traced nor reversed. Use a credit card (they offer better fraud protection than debit cards) on a secure website. And always look for “https” in the web address (as the “s” is for “secure”) and the lock symbol. Social Media Gift Exchange If it sounds too good to be true, more often than not, it is. This gift exchange promises 36 gifts in return if you buy one gift. But according to the BBB it is a variation of the pyramid scam and is illegal. Phony Websites & Apps More and more people are opting for convenience by shopping online or through phone apps. Unfortunately, this makes shoppers more susceptible to fake websites and fake apps. Just because it’s marked with an Amazon or EBay logo doesn’t mean that it’s real. For online shopping, watch out for URLs with the names of popular brands along with extra words. Bogus Charities Before donating, be sure the charity is real and you are using the proper donating method. Around the holidays, there are scam artists who send emails for fake charities or viral promos. Try these resources to ensure that you safely donate to the charities of your choice: Give.org, Charity Watch, or Internal Revenue Service. Promotional Emails Pay close attention when you receive any promotional emails. If it is not from a trusted retailer, avoid clicking any links within the email if you open it. Gift Card Scams There are thieves who copy the numbers off of gift cards in stores and call the number to check if the card is activated. Once it is, they spend the value online and the gift recipient is left with nothing. Also, never buy discounted gift cards online. The seller will keep your money and use the gift card as well. Package Theft It’s likely that you’ve seen package theft all over the news since the beginning of holiday season. To prevent this, require a signature for your deliveries. If no one will be home during drop off time, arrange to have your package held at the nearest service location for you to pick up at a later time. We hope these tips help to keep you safe this holiday season. If you have any other pointers, share them with us and your peers on Facebook, Google+, Twitter, and Pinterest. Want to secure your home or business? Shop our selection of security cameras, CCTV surveillance equipment, parts, accessories, and more at SecurityCamExpert.com. Inquire about our free CCTV quotes, sight surveys, installation, and other services by calling 1-888-203-6294. Copyright © 2019. Startechtel.com, Inc. All Rights Reserved.